One thing that you might have encountered when reading about Japan or Japanese culture, is the Daruma doll: a traditional Japanese doll usually made from papier-mâché, with a weighted round bottom, and painted red with big round eyes. These doll are said to be depicting Bodhidharma, the founder of Zen Buddhism. The Daruma doll is also regarded as a good luck charm and a symbol of perseverance, and are also used when one wants to reach a certain goal. 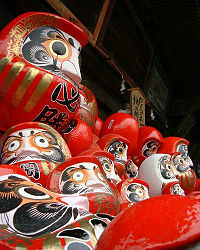 The reason for the Daruma dolls usual red colour is not entirely certain, but it is believed that it comes from the colour of priest’s robes. Because of the red colour, the Daruma doll was used a lot as a get-well-charm for those with smallpox. A child with smallpox, in the Edo period, was usually dressed in red robes, and the houses afflicted would be surrounded with ropes with red paper strips to warn others. However, the red colour of the Daruma was not to warn, but to appease the “god of smallpox” that people believed was behind the outbreaks. This in combination with the weighted bottom was to encourage the sick person to get well soon. When you buy a Daruma doll you will often find that the eyes are blank. This is used to keep track of goals or big tasks. When you buy the doll, in the beginning of a project for example, you colour in one eye. When you have reached the goal you set out for, or finished the project, you colour in the second eye as well. And while you are trying to achieve your goal, whenever you see the one-eyed Daruma, you are reminded about your goal. This practise might also be connected to “enlightenment”, as this custom has led to a phrase in Japanese that means “Both Eyes Open”, referring to attaining your goal. 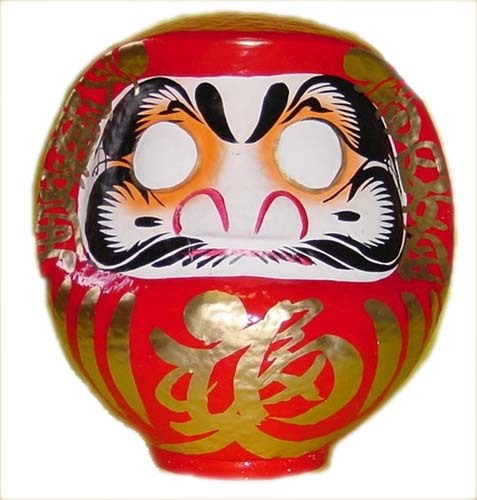 Even the facial hair of the Daruma is full of symbolism. The eyebrows are said to be in the shape of a crane, and the hair on the cheek is said to resemble the shell of a tortoise, two animals that in Asian culture embody long life. Next time you decide to quit smoking, to eat better, to save money, to do well on a test, or have a project that you want to get done, pick up a Daruma and let him help you out. And if you get knocked down, bounce back up!